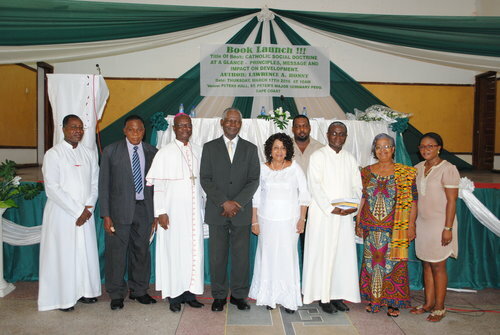 The author, Sir Dr. Honny said at the launch that his objective for writing the book was informed by a desire to correct the misconception people have that the Social Doctrine of the Church merely promotes the Catholic faith with no real message for others who do not profess the faith. He says that even though the Teachings are based on the Theology and Doctrine of the Catholic Church, it is far from a narrow profession of faith but rather deals with the development of the individual and human society. The documents and their contents, according to him are rooted in basic and universally –accepted human values and ethics. He has made the effort to bring to light the usefulness of the Catholic Social Doctrine(CSD) in order to project its potential to promote human progress. The Book according to the author outlines the key papal social encyclicals, sets out the principles of CSD as found in the Compendium of the Social Doctrine of the Church and reveals the degree to which CSD has influenced the world. Among the dignitaries who graced the event were Most Rev. 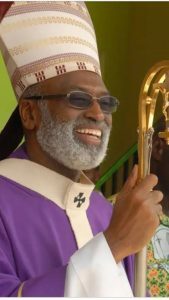 Matthias Kobena Nketsiah, the Metropolitan Archbishop of Cape Coast, Sir Kt. Prof. Annan-Prah and his wife, Mr. Luke Gyasi-Appiah who chaired the function, priests, Religious, students of St. Augustine College and Holy Child Senior High in Cape Coast and many others. The first copy of the book which was bought for the Archbishop cost five hundred Cedis. The occasion also coincided with the Birthday celebration of the Author and so the family, led by the wife, presented him a bouquet of flowers in appreciation of his love and care. Photo:The Author in suit in the middle.